The New York-based musician Joanie Leeds has spent the past few years gradually developing her career as a kindie musician. She's picked up a band (the Nightlights), a fanbase outside New York, and on her latest album, Bandwagon , she takes some big strides toward finding her own voice in the kindieverse. Those strides begin with Leeds' voice in particular. Perhaps it has sounded this good on previous albums and I just was too dim to hear it, but on this album, you can hear just how versatile that voice is, on crunchy garage rock ("Are We There Yet?") or a slow bluesy number ("Use Your Words"), among other tracks. Whether it's Leeds writing songs that use her voice to more varied effect or producer Dean Jones giving her voice the spotlight or some combination of the two, it pays off nicely. I hear two Joanies on the album -- one is the Leeds willing to be goofy and write songs laser-targeted at the six-year-old in your life ("Back to School," "Helmet," "UFO"), the Joanie that's always been present on her records. The other is the singer who writes very child-friendly pop songs (the gorgeous and winsome "Falling," "Little Cloud," and the rousing folk-pop of the title track featuring Rachel Loshak and the Okee Dokee Brothers' Justin Lansing). This other singer also gets Jonatha Brooke to duet on "Family Tree." While Leeds has never been solely goofy, this other songwriting approach gets more airtime than before, and I think it's a good thing. The 41-minute album is most appropriate for kids ages 4 through 8. You can listen to album clips here. Bandwagon is my favorite Joanie Leeds album yet, and I get the feeling that the best is yet to come. Recommended. 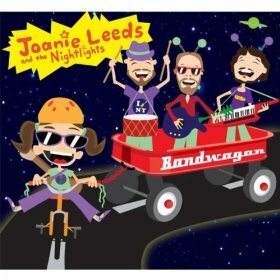 Posted in 4, 5, 6, 7, 8, Reviews and tagged with Joanie Leeds and the Nightlights, New York, New York City, Dean Jones, The Okee Dokee Brothers, Rachel Loshak, reviews, review. June 25, 2013 by Stefan Shepherd.